This Delkin Devices USB 3.0 Universal Memory Card Reader is a super speedy way to get the images from your card to your computer- without wasting your camera battery! 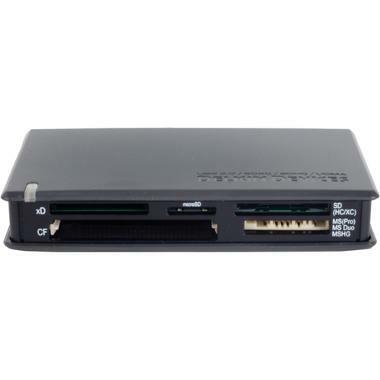 the reader itself is USB 3.0, but is also backwards compatible to USB 2.0 and USB 1.1. The following cards are listed as compatible by the manufacturer: CF Type I (UDMA), CF Type II (UDMA), SD (all classes), SDHC (all classes) SDXC (all classes), microSD, microSDHC, Memory Stick, Memory Stick Micro, MicroDrive, MMC, Memory Stick XC, Memory Stick DUO (HG), Memory Stick PRO (HG), Memory Stick PRO DUO (HG). The following OS which will work with the reader as as follows: Windows ME, XP, Vista, and 7; along with Mac OS X 9 and newer. Delkin also offers a 5 year warranty on this product, so you can buy with confidence!